This is an architect's rendering of the new, 46,000-square-foot Chattanooga Whiskey Co. distillery and barrel storage facility under construction inside the former Newton Chevrolet building at the corner of M.L. King Boulevard and Riverfront Parkway. Tim Piersant, owner and co-founder of Tennessee Stillhouse, stands with full barrels of 1816 Chattanooga Whiskey at the companies new location set to open next week on Market Street. The Chattanooga Whiskey Co. now produces one barrel a week at its Tennessee Stillhouse micro-distillery on Market Street across from the landmark Choo Choo hotel. Come the middle of next year, the homegrown distillery will be able to ramp up production by a factor of 100 — to 14 barrels a day — at a new, 46,000-square-foot facilty under construction inside the former Newton Chevrolet building at the corner of M.L. King Boulevard and Riverfront Parkway. And instead of relying on whiskey made at a distillery in Lawrenceburg, Ind., to fill its bottles, the Chattanooga Whiskey Co. will have the capacity to turn out more than 100,000 cases a year of bourbon. And it will be made from a mix of corn and other grains that the company has experimented with at its micro-distillery, which opened in March 2015. "We'll have 100-plus recipes to choose from," Head Distiller Grant McCracken said Tuesday during a ceremony at the new distillery site. Chattanooga Whiskey's three brands of straight bourbon whiskey — 1816 Reserve, 1816 Cask and 1816 Single Barrel — are made from a "mash bill" that's 75 percent corn, 21 percent rye and 4 percent malted barley, McCracken said. "The question is, how do we make 1816 better? From great to better — which is hard to do," said company founder and CEO Tim Piersant. "We look at the micro-distillery as [research and development] facility." The new production facility has tools that McCracken and Piersant said will help produce premium bourbon whiskey, including four 2,700-gallon fermenting tanks made by Vendome Copper & Brass Works Inc. in Louisville, Ky., the capital of the bourbon world. "They're the best," Piersant said. The fermenters are equipped with cooling coils, McCracken said, that will let the distillery slow down the fermenting process to produce more complex flavors. There's room in the building for 4,000, 53-gallon white oak barrels, which will be placed upright on pallets stacked three barrels high. The barrel storage area won't be climate-controlled, so — as in a traditional rack house, also known as a rick house — the bourbon can expand into the barrels' charred, white oak interior when it's hot, and come back out when it's cold, imparting flavor during the minimum two years of barrel storage required for straight bourbon whiskey. "You want the swings of temperature," McCracken said. "We'll get the swings." The Chattanooga Whiskey Co. currently sells about 10,000 cases a year of whiskey in three states, Tennessee, Georgia and South Carolina, Piersant said. The micro-distillery can produce only about 2,500 cases annually, he said, which is "not even a quarter of demand." So the company gets about 20 barrels a month of bourbon delivered from the Indiana distillery, which Chattanooga Whiskey Co. employees put into bottles by hand at the Tennessee Stillhouse. 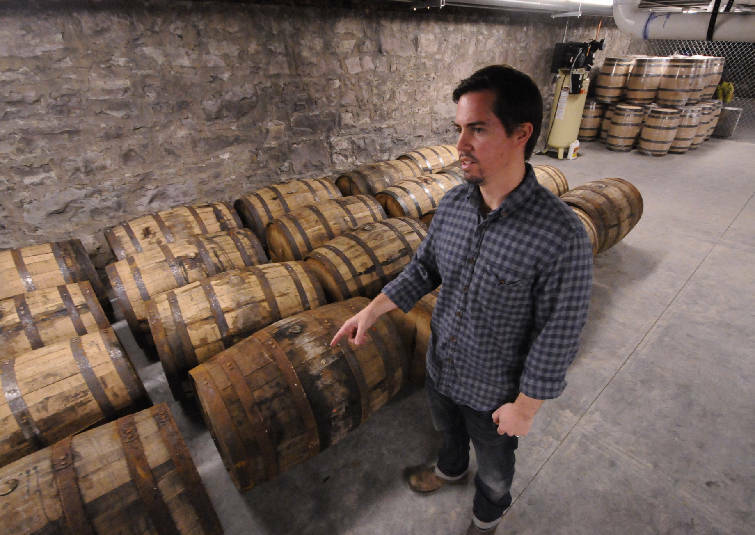 Chattanooga Whiskey Co. has enough of a supply at the Indiana distillery to hold it over until the new distillery starts running — plus the minimum two years aging it takes before the straight bourbon is ready to bottle. "We're drawing down supply, but we're in good shape," McKracken said. The new production facility won't be open to the public, but the Tennessee Stillhouse micro-distillery will remain in place and continue to offer tours, tastings and retail sales seven days a week. In its first year, it attracted nearly 20,000 visitors and became one of the Southside's most popular tourist destinations, featured in Southern Living's "50 Best Places in the South." Contact staff writer Tim Omarzu at tomarzu@timesfreepress.com or www.facebook.com/MeetsForBusiness or twitter.com/meetfor business or 423-757-6651.